A car that was damaged when a tree fell onto it on the North Circular Road in Dublin. THE MAX GUST of wind recorded during Storm Ali was 147km per hour at Mace Head in Galway. Meanwhile, a section of the ceiling over a public stairwell in the Churchwell Crescent block in Belmayne, Dublin has come off and is sitting on the remaining roof, as a result of the storm. According to Clúid Housing, 10 of the apartments are Clúid units, three Sonas units and six are Hail units. All residents affected in the 19 apartments were evacuated earlier today, and have been offered alternative accommodation, a spokesperson for Clúid Housing said. “Because of the weather status, it has been too dangerous to access the roof to remove the loose section, so we have cordoned off the neighbouring courtyard and road,” the spokesperson said. In a statement, Hail said: “Hail confirms that it is aware of the issue regarding the roof in the Churchwell Crescent apartment block in Belmayne. Our tenants have been housed in alternative accommodation and we are providing support to them at this time. Sonas has been contacted for comment. A car was also damaged at Dublin Port after containers were blown over this afternoon. No one was injured. Some 67,000 ESB customers are without power. 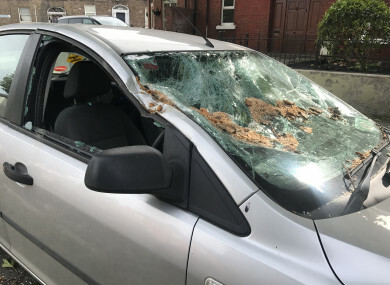 Email “Gusts of up to 147km/h recorded during Storm Ali ”. Feedback on “Gusts of up to 147km/h recorded during Storm Ali ”.